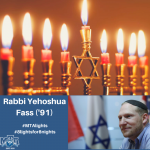 Today’s MTA Light is Alumnus Rabbi Yehoshua Fass, Founder and Executive Director of Nefesh B’Nefesh. Through his work, Rabbi Fass has helped more than 50,000 Jews actualize their dreams of making Aliyah. “My wife and I always wanted to make Aliyah, but our plans never seemed to concretize. In 2002, when a family member was tragically killed in a suicide bombing in Israel, his death and our attempt to come to terms with the loss, were the catalyst for our decision to finally move. When sharing my feelings about Aliyah with friends and colleagues, I began to hear echoes of similar ambitions. We shared a dream, but many people feared that the practical and economic challenges of making Aliyah were too difficult to overcome. Working together with Tony Gelbart, a successful businessman and philanthropist living in my Boca Raton community, we created a plan to develop an organization that would provide the proper guidance and resources to address these obstacles. This was the beginning of Nefesh B’Nefesh. If there is an individual who longs to fulfill this destiny, it is a true privilege on my part to help them return to their Jewish home. As I embarked on this journey, I took with me the inspiration of my remarkable rebbeim at MTA, whom I forged close relationships with. What inspired me most was their total devotion and dedication to their talmidim. Particularly Rabbi Yitzchak Cohen, who pushed me to reach beyond my limits and whose influence on my learning I still feel today. The very concept of Torah being our life’s anchor was reinforced during my years at MTA. These are the lessons that continue to remain with me. In honor of Chanukah, I will draw from the symbolism of this holiday. Halacha mandates that the Menorah be placed on the opposite side of the mantle that holds the Mezuzah. Hashkafically, we can learn an important lesson from this. When we enter our homes, the first thing we see is the Mezuzah, which should heighten our focus of creating an atmosphere of Torah and Mitzvot within the walls of our homes. When we leave our homes, the first thing we encounter is the Menorah, which emphasizes our responsibility to impact society, to share Jewish light and chessed within our communities and brighten our surroundings. This is what we do daily at Nefesh B’Nefesh.” Thank you, Rabbi Fass, for spreading the light of Eretz Yisrael to Jews around the world and for showing us the impact of turning one person’s dream into a reality for so many others.